A bad day for the members of the Umbrella Academy. It’s been a full year since Netflix announced that it would be adapting My Chemical Romance’s Gerard Way and illustrator Gabriel Bá’s Dark Horse comic series. Now it’s finally revealed the cast in all their superhero glory—okay, they reveal a very small portion of all their superhero glory, but we like what we see. The Umbrella Academy, set in 1977 in a world where JFK wasn’t assassinated, follows a group of mysteriously super-powered youths who get recruited to save the world from a mysterious threat by a mysterious benefactor. Those characters are, assuming Netflix hasn’t switched them up on us...though they very well might have. 1) Spaceboy (played by Tom Hopper) is the leader of the team, and has super-strength; in the comic, his mind was put into the body of a Martian gorilla, which seems... unlikely to happen on the show. 2) The Kraken (David Castañeda) is Spaceboy’s rival and has excellent control over his reflexes. He may or may not be able to hold his breathe forever (he can in the comic, but on the show it remains to be seen). 3) The Rumor (Emmy Raver-Lampman) has a bit of telepathy and can make strong “suggestions” to people to make them do what she wants. 4) The Seance (Robert Sheehan)—were not 100 percent sure what his deal is other than on the show he’s a thief; in the comics, he has telekinesis and is very morbid. At least he’s definitely looking a bit glum in the photo above. 5) The Boy (Aiden Gallagher) once traveled 50 years in the future, where he lived for 50 years; when he traveled back he became permanently stuck in the body of his 10-year-old self. This is the same as his comics incarnation. 7) The White Violin (Ellen Page) likes music. 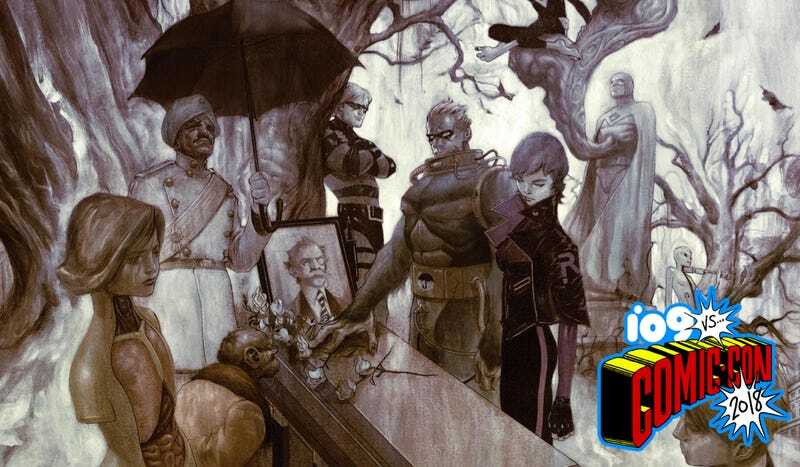 The Umbrella Academy comic felt like a direct descendant of the utter weirdness of DC’s Doom Patrol (getting its own TV show soon), which we consider a very good thing. It’s very cool to imagine Netflix bringing that level of weirdness to live-action. Still, even if it turns out to only be half as weird, we’ll be getting a very unique superhero series.